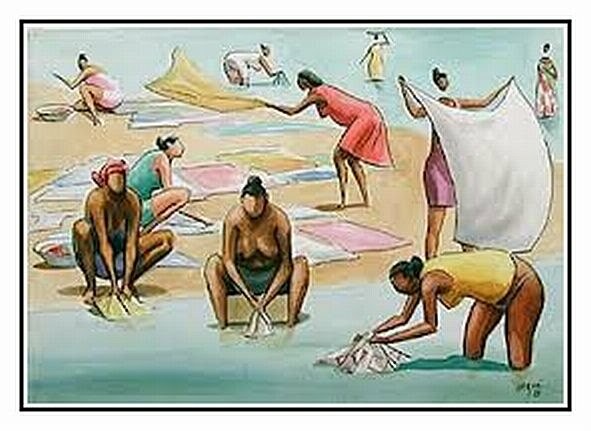 "Writing should be done in the same manner as the washerwomen of Alagoas practice their craft. They start with a first wash(ing), soaking the dirty clothing by the bank of the lagoon or stream; they wring the piece of clothing, soak it again, and then wring it once more. They then add indigo, soap and wring once, and then twice. Then they rinse, and soak it again, now splashing the water onto the cloth with their hands. They beat the cloth on a slab or clean stone, they wring it again and then one more time, they wring it until no water drops from the cloth anymore. Only after they have done all this do they hang the clean piece of clothing to dry, on a string or clothes line. Whoever goes into writing should do the very same thing. The word was not meant to embellish or to spark like fake gold; the word was meant to say." Whenever someone, as an author, tries to "communicate" something to someone else, the resulting message is a combination of the author's ideas, intentions, opinions, prejudices and emotions, including desires, neuroses and fears, all these factors being influenced by the environment, family and culture the author was raised and lived in. A translator, as a human being him/herself, should be aware of his/her own mind's workings when receiving the original message, in order to avoid, as much as possible, contaminating the message with his/her own truths and opinions. Receiving a message from an author is such a complicated process, given all the aspects which have influenced its original creation, that any contribution introduced by a not-so-cautious translator will tend to produce a sometimes disastrous result. No wonder the Italians say "traduttori, traditori". In view of the (almost?) impossibility of finding a "perfect" translator, one which would be capable of receiving the author's "message" in its entirety, with no distortions, the true professional is distinguished from people who "can speak the language" by the awareness and care with which he/she approaches the task of translating. Respect for the source message and experience translate into quality (intentional pun).